The Oppenheimer Group is a mortgage and real estate industry website design company that promises to deliver more than just a cookie cutter industry website. Their focus is upon building an attractive webpage that will also perform well from an SEO perspective. They also make their sites easy to navigate for prospective clients so they aren’t turned off when they can’t find the application forms or a method to request mortgage rate information. The Oppenheimer Group does build the designs of their websites from templates. 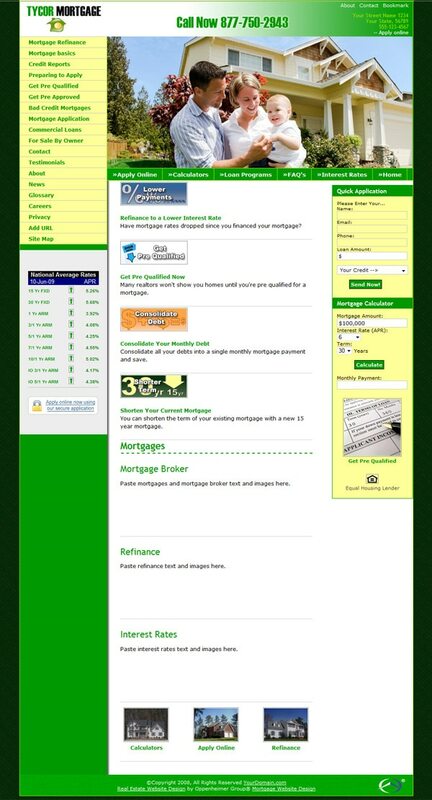 There are 4 to choose from under the mortgage category and 1 main template design for real estate professional’s websites. A startup package from Oppenheimer starts at $599 and this includes one target market in the strategy. Prices vary for those that want to add on additional markets, extra pages or have a custom website design completed.